THE BEWITCHING KITCHEN TURNS NINE!!!! I can hardly believe it. For nine years I’ve been sharing recipes, stories, dog tales, kitchen mishaps, happy and not so happy news in my virtual spot. The thrill of writing it is still with me, in many ways more intense now than ever. The overall atmosphere of my blog might be changing a little because my cooking interests have changed. I used to be a certified cake-o-phobe, but now I get more excited about concocting a genoise than making an exotic risotto. Go figure. To celebrate my 9th year of food blogging, I wanted to bake a special cake that would push the boundaries of my comfort zone a little. 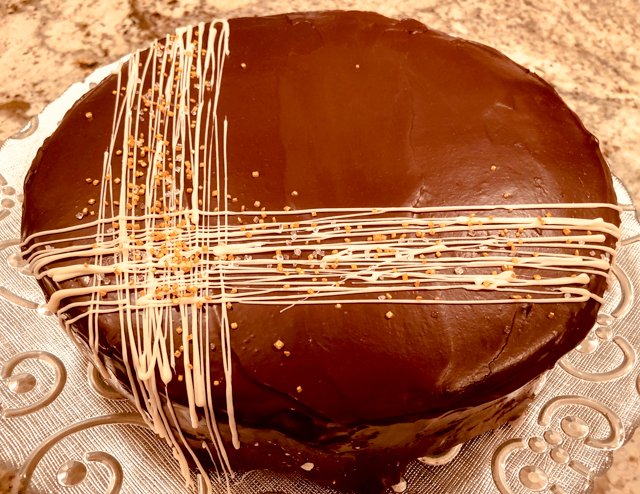 Thanks to help and advice from my friend Jennifer, Patissiere Extraordinaire, I share with you a French classic: Gateau Royal. Chocolate lovers, this is your dream come true in cake form. Make the genoise. Heat the oven to 350 degrees F. Butter a 9 x 13 inch pan and line the bottom with parchment paper. Sift the flour with the salt and cocoa powder. In a heatproof bowl whisk together the eggs and sugar. Place the bowl over a saucepan of simmering water. Whisking constantly, heat the eggs and sugar until warm to the touch, and the sugar feels dissolved if you test it with your finger. Remove from heat and transfer the mixture to the bowl of your electric mixer, fitted with the whisk attachment. Beat on high-speed until the egg mixture has cooled, and tripled in volume. It will fall like a ribbon from the beater, and form a distinct pattern on the surface when it drops. Beat in the vanilla extract. Add the flour-cocoa mixture in three increments, mixing gently by folding. Remove about half a cup of batter and mix with the hot butter. Pour that back into the cake batter and mix gently. Pour on the prepared pan and smooth the surface with an offset spatula. Do not be aggressive, the batter is delicate and the air you beat into it is all that will lift the cake. Bake for 18 to 20 minutes. Cool completely before inverting and moving on with the recipe. Make the pate noisette. Start by placing water and sugar in a skillet or a large saucepan. Heat up to 240 F. Add the hazelnuts and almonds. Gradually, they will be covered with a white film, that looks like sand. Cook until the sugar re-dissolves and caramelizes, stirring gently often. Pour the mixture on a sheet of parchment paper and let cool completely. If you have a Vitamix, use it to process the praline, in about 5 minutes you should have a very nice, flowing paste. Reserve. You will not use the full amount for the cake. Cut the sheet of cake to form an 8-inch circle. Freeze the trimmings for other uses. Center it inside a 9-inch cake pan with removable bottom and tall sides. To make removal easier, place a sheet of acetate film all around the inside of the pan. Make the praline filling: melt the milk chocolate and allow it to cool slightly. Add to 160g of pate praline, mix well. Crush the required amount of Gavottes or rice crispies and add to the mixture. Immediately spread it over the cake, bringing it to the edges in a layer as uniform as possible. Work fast because the mixture will get harder to spread as it cools. Reserve. Make the chocolate mousse. Place the cream in the bowl of a Kitchen Aid and place it in a cool place for at least 30 minutes. Beat until firm. Transfer to a bowl and keep in the fridge. Wash the Kitchen Aid bowl, you will use it to whip the egg yolks. Melt the chocolate in a bain-marie. Reserve. Heat the sugar with the water in a saucepan. When the mixture reaches 230 F, start whipping the yolks in the mixer. When the mixture reaches 240 ° C, pour it on the yolks while continuing to whip. Continue to beat until completely cool. The mixture should be clear and form a ribbon. Delicately stir in the melted chocolate. Your mousse is now ready. Spread the mousse all over the cake, making sure it completely covers the space between the cake and the wall of the pan. Add all the mousse to the top of the cake, forming a thick smooth layer that will almost reach the top of the pan. Smooth the surface with an offset spatula, cover with plastic wrap and freeze for at least 6 hours, preferably overnight. Prepare the icing. Cut the chocolate in small pieces, pour the almost boiling cream on top, wait a couple of minutes and gently mix. Add the corn syrup. Cool until it is around body temperature, and working very fast, in a single movement, pour it over the still frozen cake. Once the icing sets, decorate with white chocolate drizzle, or in any other way you envision. Keep in the fridge until serving time. Slice using a knife moist with warm water, cleaning it after each cut. Comments: Traditionally, the Gateau Royal is made with a base of almond sponge, similar to the Joconde used in the Opera Cake. 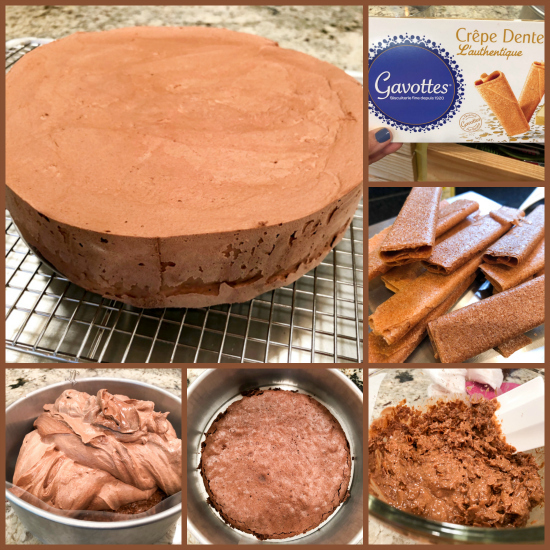 Jennifer likes it better with a genoise, because the cake needs to be fully frozen after assembling, and the genoise performs better upon freezing-defrosting. She speaks, I listen. Chocolate genoise it was. My other departure from tradition happened in the final step, the icing. A real Royale shines (literally) with the coating of a mirror glaze. I had a few issues and resorted to plan B, a more humble pouring ganache. The mirror glaze adventure shall be re-visited in the future. And I promise you won’t have to wait for the Bewitching to turn ten. I will not lie to you. Making this cake will be a labor of love. One of the components, the crunchy topping for the genoise, requires making pate noisette. The photo above shows the overall process. 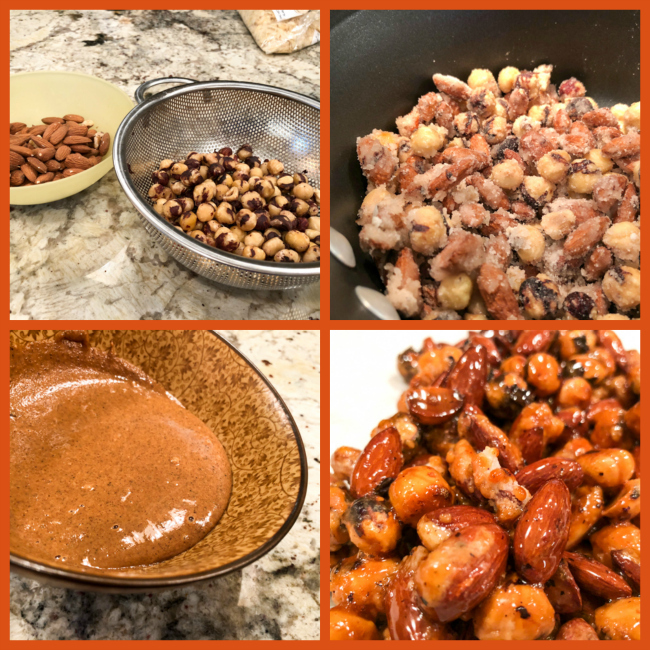 The nuts are coated with the syrup and you must cook them until it all caramelizes and forms a nice shiny coating on the nuts. It takes a little time, and constant attention. Once you get to that stage, a powerful mixer like a Vitamix is the method of choice to liquefy it, so that the result will be a luscious, thick and smooth cream. Once the pate noisette is ready, it will be combined with special French cookies called Gavottes, which will probably require a virtual trip to the Store That Sells It All, aka amazon.com. Adaptations in the US often call for rice krispies. Their job is only to provide texture. Since it’s not every day that a food blog turns nine years old, I went the extra mile and used the real deal. When folks at the department tasted the cake, the ALL wanted to know what was the crunchy filling. It is that good, my friends. Leftover pate noisette is the stuff Nirvana is made of. I put it to good use in some macarons, remember? Assembling this cake is a ton of fun. It needs to freeze for several hours before the icing is poured on top, so in case you make it, keep that in mind. Definitely better to spread the process. You can bake the cake on day one, make the praline and the mousse on day two, and coat it on day three. Easy peasy. 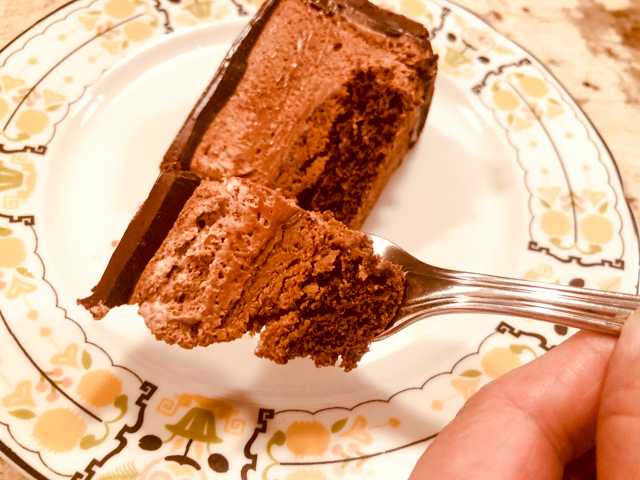 The resulting cake has everything a choco-holic loves: intense chocolate flavor in each layer, perfect contrast of texture thanks to the praline, and that Nutella-aura that turns us all into happy kids. Cannot imagine a better cake to celebrate a special occasion. A little slice of chocolate heaven! If you’ve been with Bewitching Kitchen for a while, or happened to stumble on my site today for the first time, thanks for being here! ONE YEAR AGO: The Bewitching Kitchen turns eight! TWO YEARS AGO: The Bewitching Kitchen Turns Seven! THREE YEARS AGO: Bewitching Kitchen Turns Six! FOUR YEARS AGO: The Bewitching Kitchen turns Five! FIVE YEARS AGO: The Bewitching Kitchen turns Four! SIX YEARS AGO: The Bewitching Kitchen Turns Three! SEVEN YEARS AGO: The Bewitching Kitchen turns Two! EIGHT YEARS AGO: Bewitching Birthday! NINE YEARS AGO: Welcome to my blog! This cake is amazing, and I love the direction you are pursuing. I can totally relate. These cakes as well as the breads you are making are so creative. Works of art. Congratulations on the next phase dear Sally. Congrats! So happy to share your baking genes 😍Loving your new phase. Ha! I did not know there were two kinds! Mine were milk…. I am sure either will do…. So cool that you will make this amazing cake! You read my mind! Must be part of your magic. I have been curious about mirror glazes after watching tv baking competitions. Will send you an email to attempt the mirror glaze. Thanks! Ok third time is a charm…WordPress is acting wonky so if you get multiple blog birthday greetings from me just know each and every one is heartfelt, lol. Happy blog birthday! Thank you for nine years of delicious recipes, genuine moments, inspiring stories, and truly bewitching times. You must work sone kind of kitchen magic…you even make this cat person want a dog. Here’s to many more years of wonder and joy together. Off to the Big A to track down those fancy French cookies. I want to celebrate this bewitching birthday the best way possible. nothing beats reading a comment like yours… makes it all worth it… I am in heaven! Just thinking of baking this cake makes me squirm! If you saw my pots de creme post recently you’ll know why I stay away from making desserts! This is beautiful. Have you thought about quitting your day job?!! 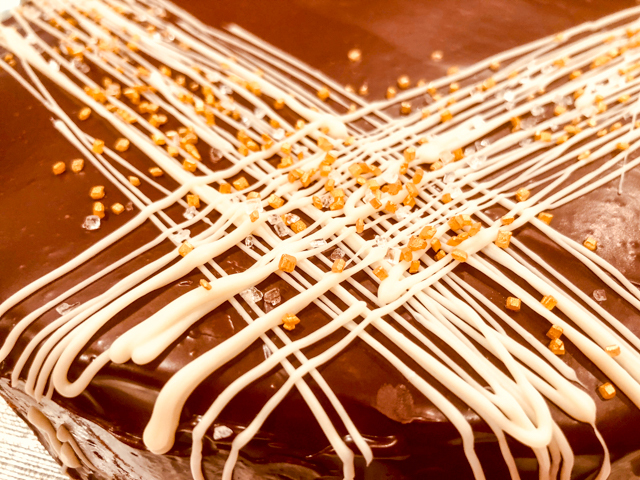 not quitting any time soon, not until retirement… but baking is definitely a serious hobby for me now – it’s odd the way it all started, from fear to passion. But baking deals with one of the virtues I lack, patience. And to me, it is a way to become more patient, or at least try to.. . my mind definitely races too much and baking slows it down. Fascinating. I should embrace baking for the same reason – lack of patience in the kitchen – but at 62 now, I can tell that my brain has gotten lazy. But also I’ve never been one to do anything fancy. – I’m more of the rustic ilk, which is fine. I am lucky to have a couple of amazing virtual friends who are serious patissiers – helps me a lot, I know I can reach out to them and they are always so helpful! Sally, congrats on another stellar year of food blogging. Allowing us into your kitchen and your life has been a gift to all your readers, all these years. I get email notices about many blogs when there is a new entry. Yours is the only one I will stop everything I’m doing to read immediately. Cakes as a new direction? I’m not surprised. After all, baking is a science as well as an art, and you’re….well, you’re a scientist! Baking perfect, astounding cakes is right up your street, as the Brits would say. Please do continue to share your other culinary adventures as well. Cheers! Congratulations on your blog’s 9th anniversary and may there be many more years of such glorious cakes ahead. 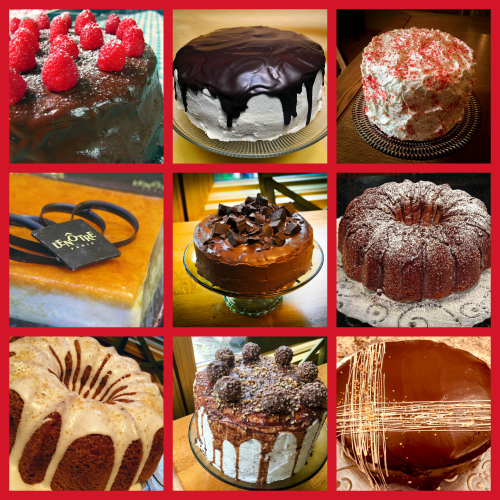 I am really excited to bake more and more…. Congratulations! And all I can say about this cake is WOW!! Impressive. Happy Birthday! What an amazing cake – hard to believe you were once afraid of baking.Give the dogs a special birthday pat. He just happened to be passing……. it is actually very true…. he was just walking by and did not expect anything to fall..
Sincere congratulations and felicitations! I may not be amongst your adoring bakers but love absolutely everything else . . . and the doggie tales always make my day . . . Happy birthday gorgeous! Not many blogs make me want to cook what they made like you do. Bring it on. I love it! I like going out of my comfort zone now and then and you do that a lot. Thank you. it’s when we go out of our comfort zone that we grow – I firmly believe in that. Plus, it’s so rewarding to learn a new skill! Thank you! I wonder if I have nine more years of blogging mojo… who knows! Thank you, thank you, thank you — for doing the things you do and taking the time to document them in words and pictures. I feel so fortunate to have Bewitching Kitchen to teach me, give me ideas, and make me smile. Parabéns pelos 9 anos de aventuras deliciosas! Qto a este bolo, well, ele tem um grande problema: eu não o comi! 🙂 Beijos ­ que venham outros 9, e mais 9, e mais! Happy blogiversary! Congrats on 9 years! This cake looks amazing.